There is a misleading report that came out of the poll body Social Weather Stations (SWS) saying the unemployment rate in the Philippines as of December 2011 stood at 24%. This equates to a staggering 9.7 million Filipinos without a job. Contrast this number with the official government figure from the National Statistics Office (NSO) of 7% unemployment rate or an equivalent 2.814 million people without a job (average for 2011). Which Unemployment Rate is Real? "those who do any work even for one hour during the reference period for pay or profit, or work without pay on the farm or business enterprise operated by a member of the same household related by blood, marriage or adoption"
“those who have a job or business but are not at work because of temporary illness/injury, vacation or other reasons." "those persons who expect to report for work or to start operation of a farm or business enterprise within two weeks from the date of the enumerator's visit"
Understandably, these factors would result to significant differences. But we could argue that the NSO data is a better gauge of unemployment rate in the country because it is recognized by international organizations such as the World Bank, ADB and IMF. Having said that, I see no need for the survey results being published by SWS. It just adds to the confusion of knowing which unemployment rate is the real one. But why should we care about the unemployment rate? What does it have to do with the economy? The welfare of the unemployed is the primary concern. When people lose their jobs, they are unable to earn money for their needs. They spend what they have saved or may go deeper into debt. So an unemployment rate that is high signifies more people are having a hard time. Secondly, the unemployment rate gives us an idea of the extent to which the economy is running efficiently. High unemployment says that labor is not being utilized effectively. It can give policy makers good reason to wonder if the economy is being run the way it should be. Perhaps, changes to policies by the government are needed to address the problem. Knowing these, we can say that the state of the economy can affect our chances of getting a job. But it shouldn’t mean that we leave it to fate and do nothing. We have the ability to get the odds in our favor. Acquiring the abilities and capabilities to help us get secured good-paying jobs should be doable if we are resolute to get it. 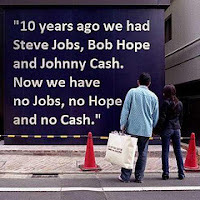 Alternatively, we can stop seeking for a job and be the boss by starting a business of our own. However we might want to go about it, we can do something and we should act on it.